Lounge is not a word I associate with pubs. It’s a word which I’d pair with ‘cocktail’, ‘first class’ or potentially ‘suit’ but not with the word pub. Despite my reservations about its name though this is a drinking establishment which exists, I’ve drunk in and intend to review. You’ll find the wooden facade of the Lincoln Lounge a short walk up York Way from Kings Cross Station and even from the outside you can see that this is a snug little spot. Going anytime after 5.30 on a weekday and you’ll need to wriggle through a cluster of smokers to get in the front door and find yourself in the long low ceilinged room that is the ‘lounge’. My only major grumble about this place is directly linked to its size and shape. Given the fight for floor space the current proprietors have opted to have minimal seating with just three tables large enough to get a group around and some tortuously uncomfortable garden seats providing less hospitable perching points just next to the gents. Subsequently most patrons end up standing either at the bar itself (a crime which will be punishable by having a foot removed when I take power) or in the corridor like nether zone between the front door and the toilets making any movement a delicate ballet of shoulder taps, elbow nudges and pint juggling. Putting that aside there are some good points. If we steer towards estate agent style vocabulary this can be called cosy and homely. It doesn’t take a great number of people for there to be a bubbling atmosphere and the staff are consistently cheerful without you getting the impression that they might be reprimanded later if they don’t smile, in other words they’re genuinely nice. The booze options are limited for the ale drinker with only two on tap but there are some fairly interesting lagers on offer taking this a cut above the average on that fromt. Compared to some of the local competition it’s well priced too – a couple of pints nearby at The Fellow won’t give you much change from a tenner but here you’ll fare a lot better. Points that are neither here nor there but I thought might warrant a mention. The decor is inexplicable; the two stools shaped like human hands are the most uncomfortable things I’ve ever tried to sit on. The DJ was playing his dubious set list from Youtube which I think just makes him a bloke with a laptop. If it’s your thing then you can get down here for Ukulele Cabaret night which is frequently hosted here. All in all I’d say this is average. Best enjoyed if you just want a swift one after getting out of work early during the winter months as given its total lack of outside space it loses out massively to nearby competition as a summer boozer. If you go too late and don’t get a seat it’s not a lot of fun but if you’re wise enough to book a table (can be done) the lively atmosphere and prices do make up for some of the shortcomings. 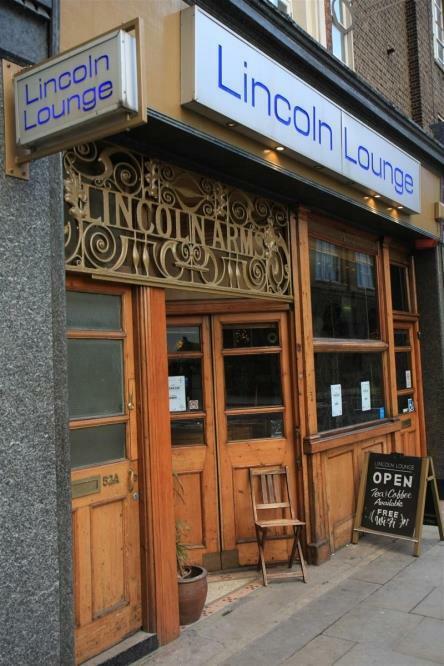 When I first noticed the Lincoln Lounge I thought it was a private members club. I had no idea it was a pub for everyone. Having discovered this fact and visited, I do like it and totally agree with you regarding the staff and I would add that the clientele’s also agreeable. Even when it’s packed to the gills I have no problem getting served. I love the craziness that is the décor, fixtures and fittings and music. If I knew enough people I would book it out for a themed party. If I had enough money I would buy it and install a roof terrace. I had the fact that the space with the low-slung sofas – perfect for chilling with friends – is right in front of the loo. Some screens, methinks. A good and fair review, Pub Raider. Do you have any thoughts on the Lansdowne in Chalk Farm?